Nathaniel Fish Moore, nephew of former Columbia president Benjamin Moore, was a lawyer by training but preferred the quiet seclusion of the scholar's life, and in 1820 accepted the position of professor of Greek and Latin in Columbia College. 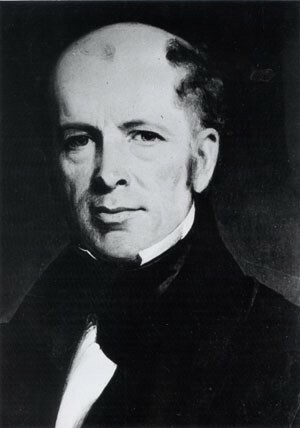 In 1838 after several years of traveling abroad, Moore was appointed Librarian of the College, the first to hold that position on a full-time basis. One of his chief duties was to put in order and to catalog his own library which he had sold to the College that year. Elected Columbia's eighth president in 1842, Moore found administrative work very uninteresting, and having private means, resigned in 1849. His administration was for the most part uneventful, marked only by the continuing struggle for money and the establishment of the first Greek Letter fraternities. Moore spent the remainder of his life pursuing his scholarly interests as well as becoming an enthusiastic devotee of the nascent art of photography; some of his photographs are preserved in the Columbia University Archives.